Working with Supertrax for the past 21 years I've had the opportunity to visit, ride and experience snowmobiling all over North America and what a ride it's been. One question I'm often asked is, of all the places I've ridden, which is my favorite. Most often, my response is, "Québec's GASPESIE has to be at the top of the list"! This region has it all, starting snowfall measured in feet, not inches. The on-trail amenities include gas stations, restaurants and full service clubhouses. The hospitality is amazing and the trails and scenic vistas surrounding the Chic Choc Mountains are world-renowned. 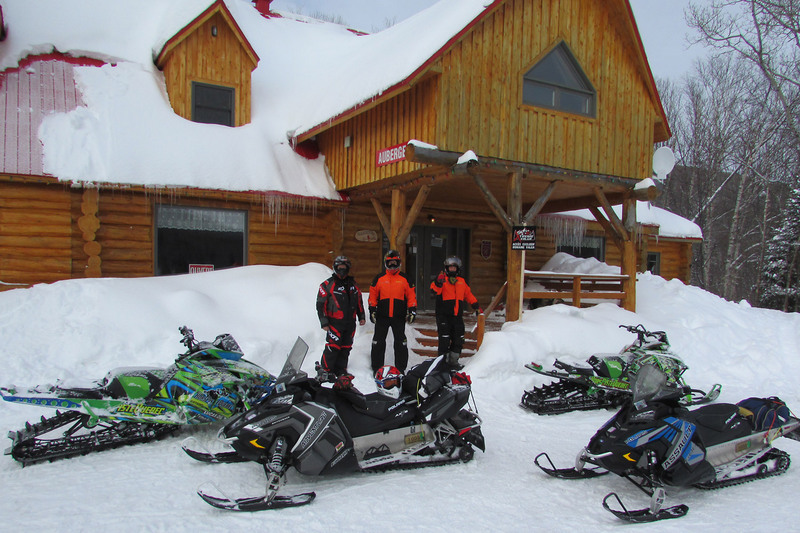 Last winter we experienced a 6-day snowmobile tour that would take us through the Baie St. Laurent and Gaspesie Regions. Our ride started on the heels of another major 3-day deluge of snow with over 3 feet of accumulation. Our trip started in Rivier-du-Loup with an overnight stay at Hotel Universal, which features heated storage, plenty of parking, 24-hour security, gas next door and Trans Québec Trail 85 out the back parking lot. Our mapped-out 275 km ride day ended up being over 300 km (200 miles) as someone missed a trail (that would be me) and because of this, we arrived a little late to our night’s lodging at Domaine Valga in Saint-Gabriel-de-Rimouski. This beautiful log Auberge is a perfect example of the many hidden gems you'll find only in Québec. It turns out this is a very popular destination for Timbersledders as well! On the second day the sky was clear and blue and the trails were freshly groomed. 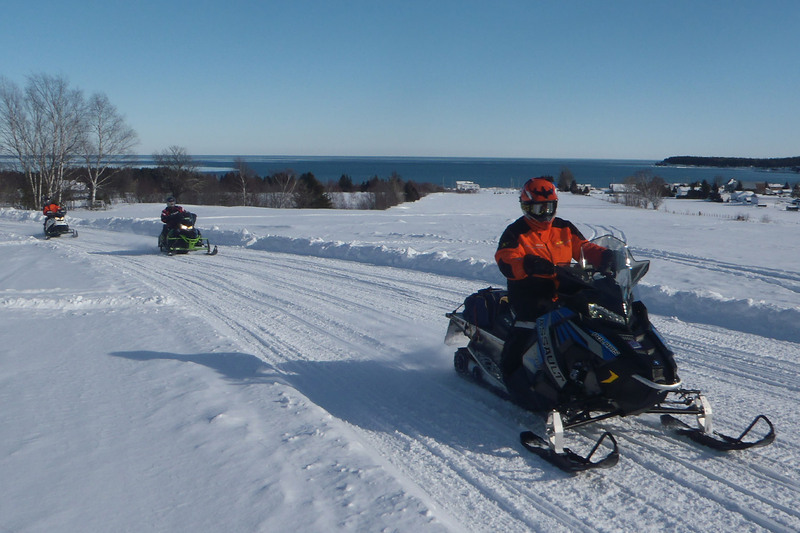 Our 200 mile day had us riding 579 South, 587 South and Trans Québec 5 to Motel Baie Bleue in Carl-sur-Mer and, once again, a full parking lot of sleds. Day 3 was our shortest, taking us on a 220 km ride to Motel Fraser in Chandler. The Fraser was packed with snowmobilers and interesting enough it was 50/50 split with folks from Eastern USA and Ontario. We had a great night with lots of good-natured banter from the snowmobile fraternity. We changed things up a bit on Day 4 with a side trip into the village of Perce to check out the legendary Perce Rock, an incredible sight to behold. As we pulled into Murdochville the height of the snow banks from the previous week's storm was amazing. Our night’s stay was Auberge Chic-Choc. We were looking forward to our next day of riding through the Chic Choc Mountains and it doesn't get any better than this part of the Québec Maritimes. Unfortunately, the weather was rainy and foggy with freezing rain - a shame because you’ll have a hard time finding more exhilarating riding than there! Here's the good news: The Riotel Matane is just what the doctor ordered. Great atmosphere, great food and a very large clothes dryer just down the hall from our room that inhaled 20 well-spent dollars to dry out all my gear. Our final day of riding back to Riviere-du-Loup is more lowland riding along the St. Lawrence River. It's fast paced and a hoot to ride and a great way to end another fantastic Québec Maritime ride. I love riding here and never tire of telling snowmobile enthusiasts to experience this incredible region. Am I going back to the Québec Maritimes? Without a doubt! I have yet to visit and ride the COTE-NORD Region on the north side of the St. Lawrence River, and it sounds like a great place to ride this March and one more to check off my bucket list.